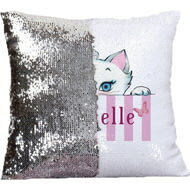 Sequin cushion covers are a must-have item. 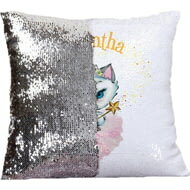 Each side of the sequin is a different colour, white and silver. Personalise the white side with a name of up to 15 characters. 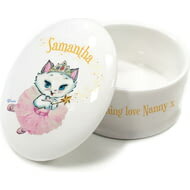 This cute bone china trinket box makes the perfect keepsake for that special occasion. 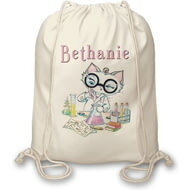 Personalise this natural cotton canvas drawstring bag with a name of up to 15 characters above Nina Kitten dressed as a scientist. 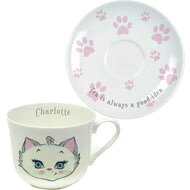 Personalise this beautiful white bone china cup and saucer with a name of up to 15 characters on the inside lip. Please note - ‘Tea is always a good idea’ is fixed text. 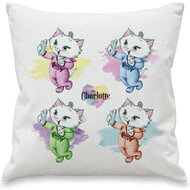 Personalise this cute cover with a name of up to 15 characters. The cover is machine washable up to 40 degrees and line dry. Iron on the reverse only. 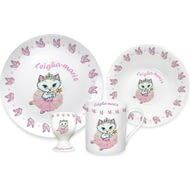 Personalise this beautiful bone china set with a name of up to 15 characters. The name will appear on every item. 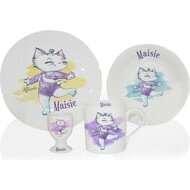 All are dishwasher and microwave friendly.